The Olive Thrush (Turdus olivaceus) is one of the commonest members of the thrush family (Turdidae) in Africa. It occurs south of the Sahara discontinuously from Eritrea and Ethiopia south to Kenya, Tanzania, The Gambia, the Cape of Good Hope and west to Angola. It is a forest bird, but has adapted to parks and large gardens in suburban areas. It can reach a length of 24 cm and a weight up to 81 grams. The tail and the upperparts are colored dull olive brown. The belly is white and the rest of the underparts have an orange hue. The throat is speckled with white spots. It can be found in evergreen forests, parks, and gardens. Its diet consists of insects, mollusks, and spiders. There are at least five geographical subspecies which differ mainly in the relative amounts of white, orange and brown on the underparts: T. o. swynnertoni, T. o. transvaalensis, T. o. olivaceus, T. o. pondonensis, and T. o. culminans. 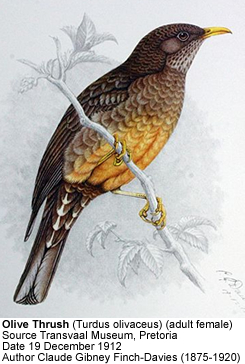 Three previously recognised forms, the Karoo Thrush (Turdus smithii), the Somali Thrush (Turdus ludoviciae) and the Taita Thrush (Turdus helleri) are now regarded as separate species and the latter two are critically endangered. It builds a cup nest, typically up to 6 m above the ground in a tree. The 2-3 blue eggs are incubated mainly by the female for 14-15 days to hatching, and the chick fledges in another 16 days. The male's song is a mix of fluted, whistled and trilled phrases, but varies geographically. It occasionally mimics other birds.